I’m having lunch with a colleague today. It’s nothing fancy. We’re just grabbing a bite to eat in my building’s cafeteria… except that I don’t want to eat there. First of all, I’m saving my pennies ’til pay-day Friday. Second, there’s never anything there that suits my plan, at least nothing warm. Oh sure, I can make myself a veggie-filled salad or munch on hard boiled eggs and a nutrition bar. But, I want something warm and comforting. So, last night I made myself a healthy, clean eating Cioppini. I’m going to bring my pretty bowl and kicky pink spoon with me to work and enjoy my seafood stew in style, knowing that I’m treating my body, mind and tastebuds well at the same time. Spray a heavy bottom pan with olive oil spray. 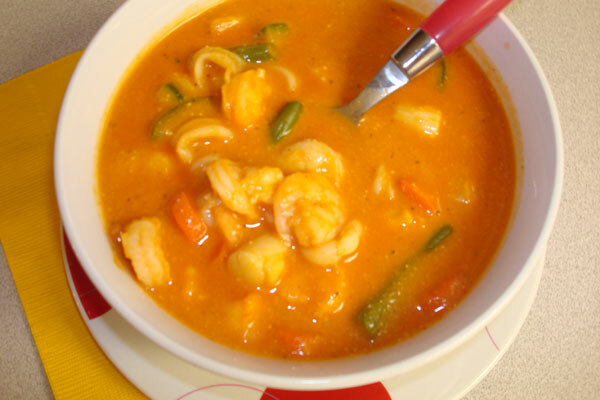 Sautee the seafood blend until warm (shrimp should be pink). Stir in Mrs. Dash seasoning. Simmer for five to ten minutes, stirring periodically, until warmed through. Makes approximately 3 servings with approximately 230 calories, 4g fat and 3.5g fiber per serving. Entry filed under: clean eating, food review, recipes. Tags: clean eating recipe, low-calorie healthy comfort food.